Signature Consultants Selected as "#1 Best Staffing Firm To Temp For" in the U.S.
Signature Consultants Selected as “#1 Best Staffing Firm To Temp For” in the U.S.
Signature Consultants, a leading IT staffing firm celebrating its 15th year in business, has been voted #1 in the “Best Staffing Firm to Temp for” category in 2012’s Best Staffing Firms To Work For competition sponsored by Staffing Industry Analysts and its publication, Staffing Industry Review. The firm’s first-place ranking was based on anonymous employee surveys conducted by Quantum Workplace, an independent research firm specializing in employee engagement. This was the first year that temporary employees were eligible to participate in the survey. 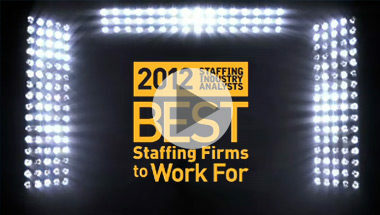 Along with being selected the winner by its temporary workers, Signature’s internal employees also voted the company as “Best Staffing Firm–Over 200 Employees,” placing it in the top five in that category. To promote Signature’s prestigious recognition, MDG Advertising created this video to announce the extraordinary achievement of winning back-to-back “Best” distinctions.